Lawyers appeared in Milwaukee almost simultaneously with the first settlers: Hans Crocker (1836), John H. Tweedy (1840), future Wisconsin Supreme Court justice Abram Smith (1842), and William Pitt Lynde (1843) were the first Milwaukee attorneys admitted to practice before the Territorial Supreme Court. Law in early Milwaukee, as elsewhere in frontier America, was a highly informal affair. At statehood Milwaukee was one of four counties included in Judge Levi Hubbell’s circuit court. Hubbell heard cases in Milwaukee twice a year, in May and November, and when business in Milwaukee was concluded, many local lawyers followed Hubbell to other county seats in the circuit, hoping to pick up business. There was little specialization: lawyers took whatever legal business came to hand. Nearly all lawyers spent much of their time in the courtroom, and the public expected them to put on a good show because trials were a key source of entertainment for many Wisconsinites. During the late nineteenth century, as Milwaukee became one of America’s leading cities, the practice of law became more formal and routinized. Lawyers began to specialize: many could now make a living without ever setting foot in court by “office lawyering,” providing advice to businesses and helping them navigate the requirements imposed by an increasingly regulatory state. Asahel Finch and William Pitt Lynde took the lead. They expanded their firm in order to serve railroads and other corporations that played an increasingly prominent part in Milwaukee’s economy, and by 1870 the firm was the largest in Milwaukee. It continues to maintain that position today under the name of Foley & Lardner. After the Civil War “in house” lawyers, who served a single employer, also appeared. John Cary served as the Chicago & North Western Railway’s counsel for most of the late nineteenth century, defending the railroad in numerous personal-injury and regulatory lawsuits, and helping guide its business strategy. Northwestern Mutual Life Insurance Co. and other leading Milwaukee companies also employed in-house attorneys after the war. After 1870 new voices also were heard in the Milwaukee bar. Throughout the nation women began to lobby for the right to practice law; after overcoming fierce resistance from Edward Ryan, now Wisconsin’s chief justice, Lavinia Goodell became the first woman to gain admission to the Wisconsin bar in 1879, and Kate Kane became the first female member of the Milwaukee bar that year. William T. Green became Milwaukee’s first African-American lawyer about 1890; he provided a strong voice for Milwaukee’s small black community, and he was instrumental in obtaining passage of the state’s first civil rights law in 1895. Two decades later Green’s colleague, George DeReef, followed Green’s practice of combining legal practice and civil-rights leadership when he led a successful campaign to end Milwaukee’s practice of excluding blacks from juries. Milwaukee and its bar continued to grow steadily during the twentieth century, spurred by the proliferation of new laws and regulations enacted by Wisconsin Progressives, and by state and federal lawmakers during the New Deal era. In 1860 there were over three hundred lawyers in Milwaukee; the bar expanded to 635 lawyers in 1922 and 2,407 lawyers in 1958; it has more than 5,000 members today (2016). As the American bar grew, lawyers in many areas established bar associations to promote professional fellowship and voice their positions on matters of public interest. Milwaukee lawyers founded one of the first municipal bar associations in 1858 and they played an active role in the Wisconsin state bar association, founded in 1878. During the frontier era most lawyers had learned law on their own or by studying with other lawyers, but after the Civil War law schools proliferated and soon became the leading source of legal education. In 1892 Milwaukee Law School was founded as a for-profit to serve as a night school for workers who wanted to study law. 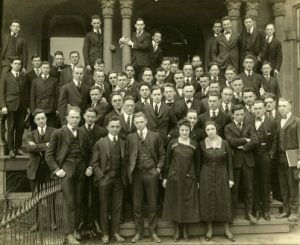 In 1908 it became a full-time school as part of Marquette University, and it continues to furnish a large proportion of lawyers practicing in Milwaukee and throughout Wisconsin to this day. Notable features of the Milwaukee bar’s recent history include the continuing expansion of its membership, which spiked dramatically in the years after World War II when many veterans used the G.I. 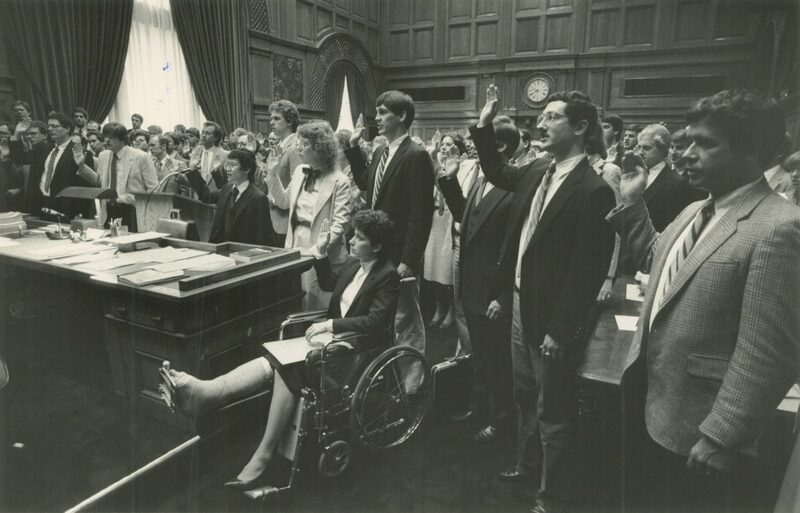 Bill to acquire a legal education and during the 1960s and 1970s when many young idealists viewed law as the best way to improve American society. The proportion of women in the Milwaukee bar also increased dramatically after 1970, rising from approximately 3% of the bar at that time to more than 30% in 2016. The Milwaukee bar has produced many members who gained state and national prominence and made enduring contributions to the law. These include Edward Ryan, who, in addition to his dispute with Hubbell, played an important role in shaping Wisconsin’s constitution (1846-48) and as Wisconsin’s chief justice authored one of the leading American opinions affirming the state’s right to regulate business (1876); Matthew Carpenter, who, as a Wisconsin senator played a key role in shaping Congressional civil-rights policies after the Civil War and argued several famous Reconstruction-era cases before the U.S. Supreme Court; William T. Green, whose role in Wisconsin civil-rights history has previously been noted; Francis McGovern, who followed Robert La Follette as governor (1910-14) and oversaw the completion of the Progressives’ reform program; Edward T. Fairchild, who provided a conservative voice of caution as to Progressive and New Deal reforms as a legislator and Wisconsin Supreme Court justice; and Lloyd Barbee, who carried on Green’s legacy in the 1960s and 1970s by leading the fight against school segregation in Milwaukee. ^ Pinney’s Wisconsin Reports, 1-3. ^ 1848 Wis. Laws, pp. 151-52. ^ See John B. Winslow, The Story of a Great Court (Chicago, IL: T.H. Flood Co., 1912), 47; Joseph A. Ranney, Trusting Nothing to Providence: A History of Wisconsin’s Legal System (Madison, WI: University of Wisconsin Law School, 1999), 583-84. ^ Alfons J. Beitzinger, Edward G. Ryan: Lion of the Law (Madison, WI: State Historical Society of Wisconsin, 1960), 29-39. ^ Ellen D. Langill, Foley & Lardner: Attorneys at Law 1842-1992 (Madison, WI: State Historical Society of Wisconsin, 1992), 34-60; John Schmid, “As It Looks to Future, Foley & Lardner Commemorates 175 Years of Shaping Milwaukee’s Economy,” Milwaukee Journal Sentinel, September 18, 2017, last accessed September 18, 2017. ^ Ranney, Trusting Nothing to Providence, 587-88. ^ State Bar of Wisconsin, Pioneers in the Law: The First 150 Women (Madison, WI: State Bar of Wisconsin, 1998), 5-6. ^ Leslie H. Fishel, “The Genesis of the First Wisconsin Civil Rights Act,” Wisconsin Magazine of History 49 (Summer 1966): 324; Joe William Trotter, Jr., Black Milwaukee: The Making of an Industrial Proletariat, 1915-45 (Urbana, IL: University of Illinois Press, 1985), 65-72. ^ Philip S. Habermann, A History of the Organized Bar in Wisconsin (Madison, WI: Wisconsin State Bar, 1986), 30-31; Thomas J. Jablonsky, Milwaukee’s Jesuit University (Milwaukee: Marquette University Press, 2007), 71-73; Ranney, Trusting Nothing to Providence, 587-88. ^ Habermann, A History of the Organized Bar in Wisconsin, 30-31; see American Bar Association Committee on Women in the Profession, A Current Glance at Women in the Law (2016). ^ For more information on Ryan see Beitzinger, Ryan; as to Carpenter, see E. Bruce Thompson, Matthew Hale Carpenter: Webster of the West (Madison, WI: State Historical Society of Wisconsin, 1954); as to Green, see Fishel, “Genesis of First Wisconsin Civil Rights Act”; as to McGovern, see John D. Buenker, The History of Wisconsin, vol. 4: The Progressive Era, 1893-1915 (Madison, WI: State Historical Society of Wisconsin, 1998); as to Fairchild and Barbee, see Ranney, Trusting Nothing to Providence. Beitzinger, Alfons J. Edward G. Ryan: Lion of the Law. Madison: State Historical Society of Wisconsin, 1960). Langill, Ellen D. Foley & Lardner: Attorneys at Law 1842-1992. Madison: State Historical Society of Wisconsin, 1992. Ranney, Joseph A. Trusting Nothing to Providence: A History of Wisconsin’s Legal System Madison: University of Wisconsin Law School, 1999. Ranney, Joseph A. Wisconsin and the Shaping of American Law. Madison: The University of Wisconsin Press, 2017. Trotter, Joe William, Jr., Black Milwaukee: The Making of an Industrial Proletariat, 1915-45. Urbana, IL: University of Illinois Press, 1985.